Staying active in your fitness goals can sometimes start off with all the integrity in the world, then, work gets busy, the kids get sick, or your heart hurts a little and suddenly you’ve found yourself without the “time” to work out. The funny thing about time is, you create what you put on your calendar. I can’t tell you how many times a client will tell me they were attending class 3-4 times a week, then they just got too busy and had to quit all-together. 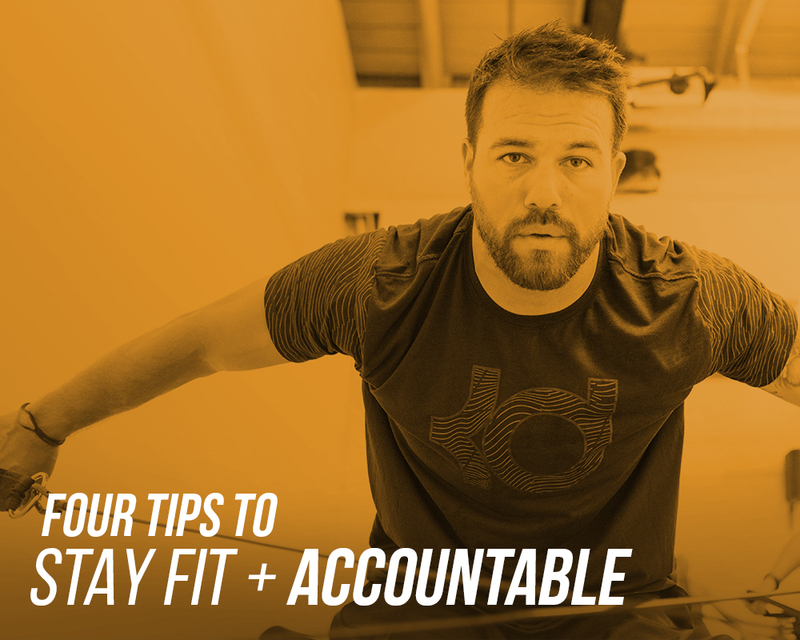 Personal accountability is a huge reason why a routine will succeed or fail. Here are some tips to help stay one step ahead of your crazy busy life and keep your routine game strong.. Slow and steady wins the race. Instead of attending so many classes in the first few months that you think your muscles might explode, try taking it slow and be more realistic with how often you’ll be able to attend. I’m sure you’ve had a boss throw a completely unrealistic deadline at you, where you had to a pull an overnighter to make it happen, but if you had to keep that momentum going forever, you would probably quit within the first year! The same rule applies in your workout regimen. If working out 2-3 times a week suits your lifestyle, then don’t stress yourself coming more often. Plus, you’re more likely to stick with your routine during stressful periods, if it’s actually attainable, which will help you stay clear in the body and mind during those crazy busy weeks. *Side note – if you reduce your number of workout days, you should be performing high intensity exercise to keep achieving results (i.e. a constant challenge to grow your muscles – the fat burners of the body.) Read more about the benefits of high intensity workouts here. Measure your progress. Take before and after pics, write in a “mood journal,” or measure your time in an exercise. It’s so important for your routine longevity to measure a benchmark which keeps you motivated. The human psyche requires working towards something, so, if you stop working towards a goal (yes, even with fitness), then you’ll end up getting bored with your routine, even if it’s still working the same physical magic as before. If you can’t see it, it didn’t happen (just ask the stars of Instagram). Think of your need for spontaneity in a relationship – the same holds true for your fitness goals! Use social pressure to your advantage. It’s no surprise a part of our human psychology towards specific actions is influenced by our peers, and vice versa (thanks for the life lesson, Zuckerberg). When you work out with a friend, share your workouts on social media, invite a co-worker to class, or talk about your sore glutes at the bar on a Friday night, you literally become the person you want to be. Why? Because now there is social proof of your commitment, and humans hate it when they don’t live up to their word, or their presentation of themselves to their peers. The good news is, you can use social pressure to your advantage. If you really want to stick to a workout routine, just talk about it! Always a silver lining, right? Stay curious. Discovering is an extension of the spontaneity and growth mentioned from tip #2. Stay educated on health, fitness, and wellness topics, and you’ll get more purpose and spontaneity in your workout routine. You can watch the latest health documentaries, stay up to date on a fitness blog, read a book on your workout of choice, or hang out with a fitness-nut friend (*cough* befriend a trainer, and you’ve got this one hacked) – all of these will keep you actively engaged in your own progress, and they take very little time to do. If you’re reading this article, you’re already active on this goal! Remember to stay critical of all sources and do some fact checking! There’s more noise out there than you think. See you on a Megaformer! Fun fact – did you know you can work over 600 muscles in a single CORE40 class?! **Refuel your package with $40 savings on 20 more classes (reg. $400, you get it for $360)! Use the code: stayfit20 at checkout for the 20pk option. Don’t wait too long, the discount expires on 7/31/2017 at midnight! Get it here!